Washington & Jefferson College honored 1994 grad Kenyon Bonner Tuesday night for the leadership he’s displayed in his 13 years at Pitt. Bonner, Pitt’s vice provost and dean of students, received the Maurice Cleveland Waltersdorf Award, given to W&J students and alumni who have the demonstrated leadership qualities similar to that of Maurice Waltersdorf — former 32-year chairman of the Department of Economics at the college, according to a W&J press release. 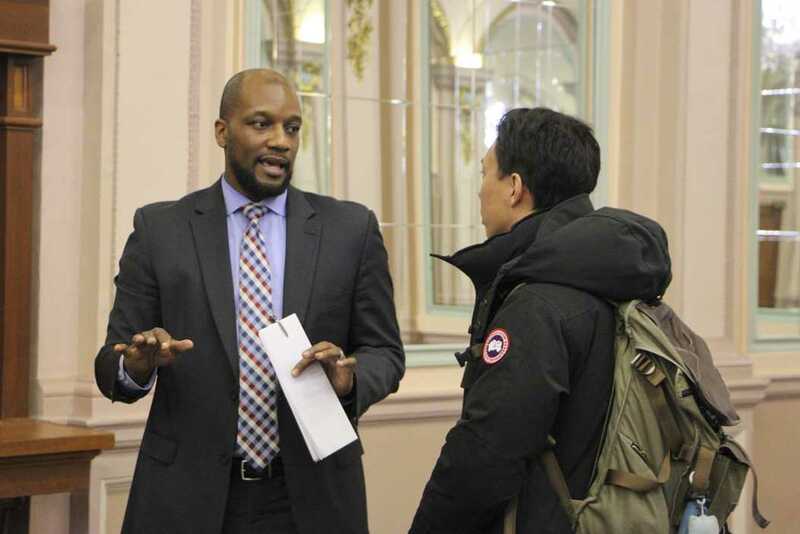 “Bonner is passionate about his work in student affairs and believes that working with college students is one of the greatest privileges in the world,” the release said. After starting at Pitt as the associate director of residence life in 2004, Bonner quickly advanced through the ranks of the Division of Student Affairs, becoming director of student life after less than a year at the University. He received the Chancellor’s Award for Staff for Excellence in Service to the University, which is the highest honor the University of Pittsburgh bestows on staff, in 2013 for his engagement with students and staff. Pitt named Bonner interim vice provost and dean of students in January 2015, a position he officially assumed February 2016. As dean, Bonner is responsible for overseeing the Division of Student Affairs, which includes Student Life, Residence Life and the University Counseling Center. When Bonner was hired as dean, Provost Patricia Beeson said he would focus on evaluating the University’s advising and career services, expanding the OCC and addressing diversity on campus. As part the the Year of Diversity, Bonner has held two Dialogue with the Dean events focused on getting student input on issues of diversity. Along with his focus on diversity, Bonner also places high value on learning outside the classroom. During the hiring process, Bonner said he would prioritize improving student involvement in the OCC. “We need to make it more seamless. Students are participating in things we think they should be, but we have to show it makes a difference,” he said in his interview for the position. Bonner graduated from W&J in 1994 with a bachelor’s degree in psychology and philosophy. In his senior year there, he helped the college’s basketball team reach the NCAA Division III Elite 8. He was also the inaugural president of the Black Student Union and continues to work with the African-American community at the college. After his undergraduate years, Bonner earned a master’s degree in rehabilitation counseling at Kent State University. He is currently pursuing a doctorate in higher education management at the University of Pennsylvania.